When in 2001 the biochemist Patrick O. Brown and the computational biologist Michael Eisen decided to open their non-profit foundation PLOS (Public Library of Science) to create a scientific journal that leaves free access to all articles published, no one believed they would have succeed. But they were tenacious and with the help of the Berry Gordon Moore fondation, their dream became true. Eisen and Brown have shown that it is possible to run a scientific journal by charging all publication costs to the authors for the “modest” sum of about 1,000 EUR per article. Today PLOS One, one of the journals managed by the PLOS foundation, is the largest scientific journal for number of published papers. Topics range from biology to physics, social sciences, etc… Articles are not excluded a priori by the editors because they are not important, as in other journals, or because the are not related to a specific field. Let me add that each paper brings money, so even a mediocre but correct one promotes the magazine business. Another feature they added to PLOS One is the possibility to add comments below each article, like in this blog. PLOS has revolutionized the world of scientific publishing by creating a new form of business and allowing everyone to access to the scientific literature. The other journals did not stand idly and tried to imitate this new business. For example, the Nature group opened Scientific Reports, a multidisciplinary open access journal where editors are usually much less strict than editors of the other Nature journals. Nature is also considering whether to transform Nature Communication in another open access journal … we’ll see. Finally the APS has recently created PRX a general physical open access journal. The possibility to download papers for free pleased Universities and Research Institutes that have not to worry about making new subscriptions, delegating to the researchers the problem of funding their publications. Now let return for a moment at the beginning of this story. Eisen and Brown were motivated by the fact that in biology the major part of the scientific literature was not freely accessible, even when financed with public money. However this is not true in other fields such as physics and mathematics. In fact, thanks to arXiv, created by Paul Ginsparg in 1991, a free service to put online preprints or published articles, most of the scientific literature is available for free. In principle it might even possible to make all scientific literature free, by forcing researchers to deposit their articles on arXiv, as the French system did with the HAL repository. So you may wonder what sense have open access journals in physics and mathematics? Why several colleagues pay have their papers in PRX, Scientific Reports, PLOS ONE etc …? The motivation is just the visibility that these magazines offer respect to other traditional journals. In fact many of these journals have earned a good name and a great audience. This means that many researchers, especially in biology, social sciences, but also physics of complex systems etc .., prefer to publish in open access journals, not because they think it’s important that their articles are accessible to a large public but only because they consider these journals most valuable than traditional ones. This phenomenon is creating a vicious circle. In fact groups with large funds send their articles in open access journals, the journals get more citations because papers from large and well funded groups tend to be more cited (in part due to the group self-citation), the journal increase their impact factor and so on….. The research with few money try to avoid additional fee for their publications and prefer to go for traditional journals. This mechanisms is creating a gap between rich and poor researchers. If we continue in this way in the future we will have journals for poor researches and journals for rich ones. And the last ones will be clearly more valuable or number of citations and impact factor then the firsts. A possible solution to this problem has been proposed by journal Forum of Mathematics that charges the publication cost to the Institution and not to the authors. In this way also young researchers and graduate students will be able to publish in an open access journal even if they did not get funds. 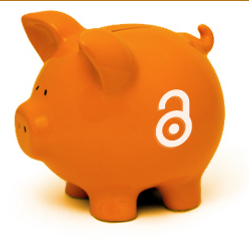 Can this be the new revolution of open access journals? we’ll see. *) Notice that PLOS ONE gives the possibility to a research who do not have money to publish if he proves that neither he nor his institution are able to pay.